The Pretty Little Liars spinoff/follow-up has a confirmed premiere date and Freeform’s debuted the official trailer. Pretty Little Liars: The Perfectionists will join Freeform’s primetime lineup on March 20, 2019. The spinoff will air on Wednesdays at 8pm ET/PT. Season one of the series is based on characters from Sara Shepard’s Pretty Little Liars novel and the novel The Perfectionists. I. Marlene King (Pretty Little Liars, Famous in Love), Charlie Craig (Pretty Little Liars, The 100), Leslie Morgenstein (Pretty Little Liars, The Vampire Diaries), Gina Girolamo (The 100, The Originals), and Joseph Dougherty (Pretty Little Liars) serve as executive producers. The first episode was directed and executive produced by Elizabeth Allen Rosenbaum (Relationship Status). The cast is led by Pretty Little Liars fan favorites Sasha Pieterse as Alison and Janel Parrish as Mona. 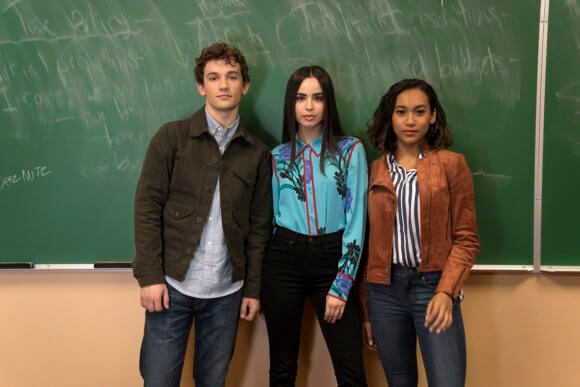 Sofia Carson (the Descendants franchise) plays Ava, Sydney Park (The Walking Dead) is Caitlin, Graeme Thomas King (The Widow) is Jeremy, and newcomer Eli Brown plays Dylan. Kelly Rutherford (Gossip Girl) stars as Claire Hotchkiss, the matriarch of the Hotchkiss family. And Hayley Erin (General Hospital) fills out the cast in a mysterious, unnamed role. Everything about the town of Beacon Heights seems perfect, from its top-tier college to its overachieving residents – but nothing in Beacon Heights is as it appears to be. When the high-stakes environment pushes the residents to a breaking point, someone snaps and kills someone. As they work together to solve the murder mystery, it soon becomes clear that behind every Perfectionist is a secret, a lie – and a needed alibi.